In 2009 I decided to run for office to help more people get the opportunities they need to get ahead in today’s America. I was privileged to serve two terms in the Nevada House, then run as the Democratic Nominee for Lt. Governor, and later, for Congress. I didn’t have the background of a typical politician then, and I don’t have it now, but I have personally experienced the impact an investment in people can have on their future. 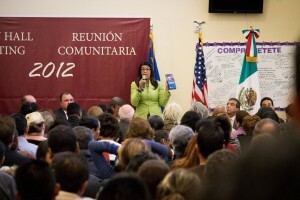 It’s what motivates me to give back to our community and what inspired me to run for office. I grew up in a challenging environment, and like too many kids in Nevada and across this country, I fell through the cracks. After my mother left my family when I was 9 years old, and without a support structure at home or in school, I got involved in the only thing I had left: gangs and negative influences. Law enforcement and inadequate school policies pushed me to the school to prison pipeline – a pipeline that is all too present for so many young people in our country still today. By 15 I was on juvenile parole and by 17 I had dropped out of high school. I ended up with a juvenile parole officer who was the first person to treat me like a kid with problems instead of just a bad kid. Like so many, I was released into the same environment, the same friends, the same family, with no tools but was expected to do better. I didn’t. But when my parole officer had the opportunity to revoke my parole, she did what so many others wouldn’t have done – she gave me another chance. And by doing so she was the first person to make me feel like I could do better. I didn’t know how. I didn’t know when or what, but I knew that I was given a chance and I needed to figure it out. Through hard work and the continued investment of people who cared for and believed in me, I got my GED, enrolled at the Community College of Southern Nevada Cheyenne Campus, and earned my bachelor’s degree at the University of Southern California as a transfer student. I went on to earn my law degree at the UNLV Boyd School of Law and was recognized with multiple awards for my work and accomplishments in the community. In my last year of law school, I ran for office to represent my community, serving as State Assemblywoman representing Assembly District 28, serving the same community I grew up in and had also spent so much of my youth incarcerated in. While in office, I successfully passed systemic change and improvement to the way young people are tested by our high schools, protected consumers from predatory practices, and shielded victims of domestic violence from abusers. After my last election in 2016; a high profile full-of-controversy race; I took everything I learned about effective communication to the digital and social media space. As a media executive, I began adding to my arsenal of tools to understand the changing landscape of communications, but also better advocate for underrepresented voices in main stream media. 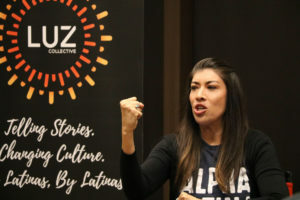 As co-founder and CEO of Luz Collective, my mission continues to be what it always has been: fighting for systemic change that puts underrepresented voices first. We have so much work to do – income inequality is the worst it’s been since post World War II with no end in sight for the continued widening of the income gap. Our political system is dominated by enormous amounts of money coming from corporations and the wealthy elite. Healthcare access in many ways is even more inaccessible now than before the passage of the Affordable Care Act and we are still fighting the billion-dollar insurance industry to make healthcare a right, not a privilege. Small businesses and middle class taxpayers struggle under the burden of a tax system that works perfectly fine for the biggest corporations and the wealthiest of people, but is slowly squeezing the middle class and small businesses into non-existence. The jobs of the future require strong schools for our children and access to free college education. Active duty service members, veterans and their families who have sacrificed so much should be taken care of abroad and at home. And Social Security and Medicare should be expanded – Period. The struggle for women’s health, reproductive justice and economic empowerment feels never ending. And the continued systemic racism, bias and abuse against people of color is a stain on what this country stands for. With an inhumane and completely broken immigration system that makes criminals of families and dampens our economic growth potential, it’s obvious that this country is in need of radical change. We’ve reached the tipping point for our economy, our environment and our future. 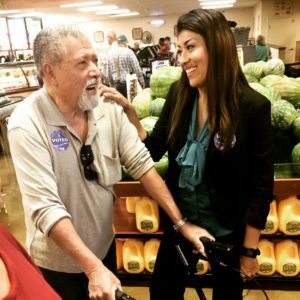 Having gone through so many personal challenges and in learning from my Dad that there is nothing in life that can’t be overcome, I know that the only thing that can be done is to continue the fight until we finally level the playing field for our children, families, and workers. The struggle must continue until everyone who desires has the opportunity to achieve their version of the American Dream, no matter who they are, what family they come from, or what zip code they grow up in.